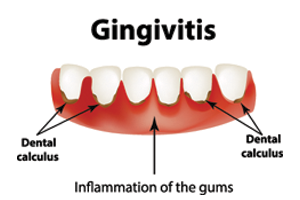 Gingivitis is an inflammation of the gums and is commonly caused by bacteria that accumulates along the gum line. A periodontal specialist can treat the condition if it is caught in its early stages. If left untreated, however, gingivitis can spread to the underlying tissues and lead to more serious forms of gum disease, such as tooth decay, periodontists, and eventually tooth loss. Chronic gingivitis is also been linked to systemic diseases such as diabetes, respiratory conditions, coronary artery disease, and rheumatoid arthritis. Gingivitis occurs when plaque – a clear, sticky film composed of bacteria – hardens and adheres to your teeth along the gum line. This buildup, called tartar, collects bacteria and is difficult to remove. You can prevent tartar from occurring by brushing your teeth at least two times per day and flossing at least once per day. A professional dental cleaning is required to remove tartar. Sometimes, a deep cleaning may be required and can involve scaling, removing tartar above and below the gums, and root planing, smoothing rough tooth surfaces and removing infected areas from teeth. The healthiest gums are firm and fitted around your teeth. If you notice any inflammation or sensitivity, make an appointment to see your dentist. Healthy gums are light pink in color. If you notice your gums appear darker or more red than pink, this could be a sign that you are developing gingivitis. Most people see a little blood in their mouth and assume they simply brushed too hard or didn’t floss enough. While this might be true, bleeding gums can be a sign of a more serious problem. If your gums bleed when you brush or floss your teeth, talk to your dentist. If you experience bad breath that does not go away after brushing, this could mean your gums are inflamed or infected. Bad breath can also be caused by eating some foods, taking certain medications, and dry mouth. However, discuss any unexplained bad breath with your dentist. This could be a sign of a bigger problem. A receding gum line is when the gums wear away from your teeth, exposing more of the tooth or root. This may be difficult to identify, so it’s important to visit a dentist regularly. Gingivitis can also cause pain when chewing, sensitivity in one or several teeth, and loose teeth. More severe or advanced cases of gingivitis might require treatment with antibiotic medications or surgery. Although gingivitis is common and can occur in anyone, there are certain factors that can increase your risk for developing it. These include genetics, smoking or dipping tobacco, hormone changes, crooked teeth, advanced age, poor nutrition, and conditions that decrease immunity. Remember, gingivitis can be easily treated or prevented with proper and consistent oral hygiene, which includes visiting your dentist at least once per year. Call our dental specialists today and schedule a consultation at our dentistry practice in Oklahoma City. Your gums will thank you!